A 38-year-old man was robbed at knifepoint in broad daylight in Huddersfield town centre. The victim was initially asked by one man for a cigarette before his accomplice, another male, produced a knife and demanded he handed over his mobile phone and cash. The victim gave the men a quantity of cash. Police are seeking witnesses to the incident which occurred between 12.30-12.45pm on Friday 8 January, at the junction of Fitzwilliam Street and St Johns Road. Both men are described as being white and aged in their late 20s to early 30s. The first man is described as around 5ft 9ins tall, of average build, with short, mousey brown hair. He was clean shaven, spoke with a local accent and was wearing a black jacket and blue jeans. The second man, with the knife, is described as around 6ft tall, of average build, wearing a dark blue, denim material baseball cap, a royal blue nylon jacket and blue jeans. He was also clean shaven. 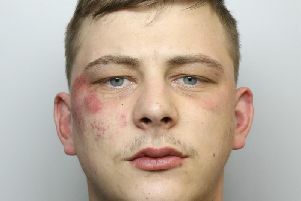 Anyone who witnessed any part of this offence or who saw men matching the suspects’ descriptions in the area around the time of this offence is asked to call Kirklees District CID via 101.